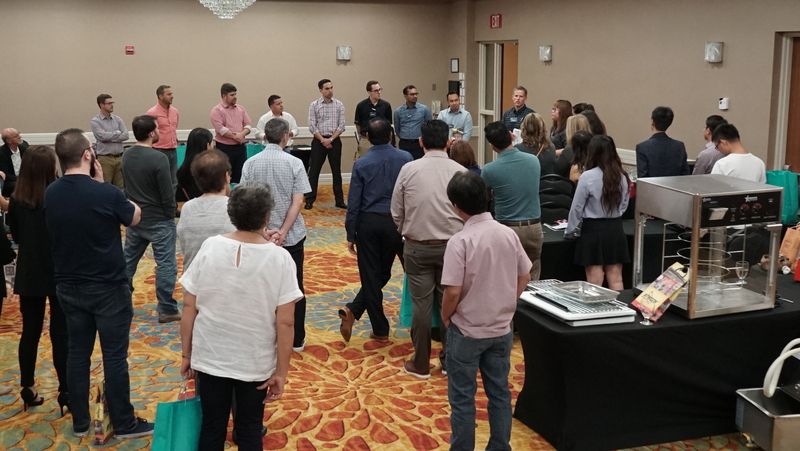 From Asia, to South America, to Pepper Mill court in Mississauga; there were plenty of faces that attended the 2018 vendor conference planned and held at the Marriott in Niagara Falls this September. Once a year, Omcan and it’s associates travel together for a weekend mixture of work and play. During the day, the staff attends the presentations that the affiliate vendors have prepared; probably made during those long plane rides! The presentations were well planned, executed, and very knowledgeable. But the real star of the weekend was the team building activities that took place after the work was done. And that activity was a stunning wine tour along Niagara on the Lake. It started at the Pondview Winery, a perfect place to start that set the flavor and tone for the entire evening. At Pondview, we were introduced to fresh white and red wine, as well as a demonstration on the proper technique for drinking Ice Wine (which was life changing). After the tastes were over, Pondview opened the doors of their beautifully rustic retail shop. There you could shop or even pick up a wine based slushie! When the double decker bus(oh yeah, did I forget to mention that part?!) pulled into it’s next stop, it was at the gorgeous Inniskillen winery. The land looked like it went on and on for miles in every direction. This caused such an intimate atmosphere that when we started out tours, we felt like the most secluded V.I.P guests in the world. This tied into the tour itself; the Inniskillen grounds are breathtaking; they’re steeping in history and never forget where they came from. When our tour guide went into detail as to why they settled on that location is what truly won me over. Travis, the guide, went on to describe that when air currents hit the high hills across the field, it ricochets back, warming up to help sustain the perfect environment for growing grapes; that amazing attention to detail is something to be admired for sure. When the amazing tour was finished, we found ourselves in the shop once more to taste what we were looking forward to for 2 hours, and it was well worth the wait. Then back on the bus we went for our last stop; dinner. Our last stop was at the Strewn Winery, where we stopped to dine at their beautiful restaurant; Oliv. This dinner was the culmination of our time together. Sitting with all your friends and colleagues, enjoying fantastic food after such a large shared experience from the tour and tastings. Nothing brings people together like sharing a meal at the same table, especially when the food is as delicious as this was. But that’s what it’s all for right? This weekend served it’s purpose in bringing everyone closer together, and that is a benchmark trait of Omcan. Everyone needs to work, that’s a given. But there’s no reason why you can’t enjoy events and share time with those that work around you. And that’s exactly what happened; The vendors from China and Colombia were able to fly all this way, by themselves, and still have a great experience with all of us here and gives hope to the possibilities of where to go in the fall of 2019.